It isn’t a coincidence that author Sarah Tomlinson goes by the @DuchessofRock on Twitter – she puts together a pretty awesome playlist. 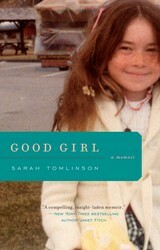 To kick off the release of her memoir, Good Girl, Sarah shared with us the songs that inspired her. You can also catch up on what books she’s been reading lately. To listen to the whole playlist and follow on spotify, click here! My mom and stepdad were always listening to amazing music around the house. Joan Armatrading was one of my favorites, and the first concert they ever took me to see. Peter Gabriel’s album, Security, was on heavy rotation during my childhood. I was mesmerized by this song, which I found wonderful and spooky. Shock the Monkey? Which monkey? Why shock it? I first heard Sinead when I was around 12. I loved everything about her; how she could be so beautiful and ferocious, and I’m really glad to have had her as a role model at that age. As a teenager, I felt really isolated (as teens do), and I loved how messy and angry punk was. I was also drawn to the camaraderie of a scene that included everyone. The Misfits were also funny, which I liked. It’s impossible for me to express exactly how much I loved The Cure as a teenager. Seeing them on the Disintegration tour when I was 13 literally changed my life. I had found my people: The Goths. I went crazy for Courtney on first listen. She was so smart and funny and powerful–and such a delicious mess–all of which intrigued me. Hole’s concert in April ’94 was one of the rawest shows I’ve ever seen. My first introduction to Elliott Smith, other than waiting on him at the organic grocery store where I worked, was his band, Heatmiser, who played out often when I moved to Portland in 1995. The Murder City Devils – All that was great about the Pacific North West punk scene when I lived in Portland in the mid-to-late 90s, I always adored The Murder City Devils and saw them often. While in Portland, I first fell under the spell of the band that remains my all-time favorite, the glam-tastic T. Rex. Every time I listen to T. Rex, no matter what’s going on, they make me purely, truly happy. When I wrote about music in Boston in the early ‘00s, I was awash in incredible local bands, including The Lot Six. One of the best live shows, ever. I also had the chance to write about some great bands that were coming up at the time, including The Strokes. We always listened to this album when we were getting ready to go out, and it still holds up. Although it was clear Conor didn’t enjoy being interviewed at all, I was thrilled to sit down with him at the Life Café in NYC when this album came out. I later saw him play often when I moved to LA. His music got me through some of the roughest times of my life. When I first moved to LA in 2006, and started writing about music there, the Silversun Pickups were just blowing up, and I always loved seeing them play this song live. One of my favorite musicians and people living and working in LA, Becky Stark of Lavender Diamond also has a gorgeous voice and sensibility. Told with raw, rugged honesty, this heartrending memoir from journalist Sarah Tomlinson recounts her unconventional upbringing and coming-of-age as colored by her complicated relationship with her father. In this unforgettable memoir, Sarah conveys the dark comedy in her quest to repair the heart her father broke. Bittersweet, honest, and ultimately redemptive, GOOD GIRL takes an insightful look into what happens when the people we love unconditionally are the people who disappoint us the most, and how time, introspection, and acceptance can help us heal.